Developed in conjunction with some of the worlds leading perfomance vehicle manufacturers including Aston Martin, Ferrari, BMW and Lamborghini. The Pirelli P Zero Corsa system is the most sporty tyre on the market according to Pirelli. Designed for both use on and off tracks, the structure of the P Zero Corsa system enables optimum stability, handling and cornering all at high speeds. 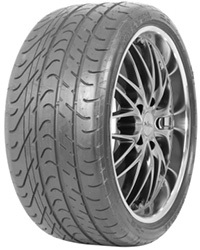 This Asimmetrico version can be fitted to both front and back axels, however, optimum perfomance is achieved when using Direzionale tyres on front axels and asimmetrico on the rear. With their experience gained as the Formula 1 tyre supplier and in conjunction with renowned manufacturers Pirelli have developed one of the highest calibre of tyres we've ever seen here at Easywheels.co.uk. Scoring a top rating in all sizes for wet braking performance during EU tyre labelling tests and receiving top marks for performance in internal testing at Pirelli, the Pirelli P Zero Corsa system really is in a class of it's own. Produced in both directional (For front axels) and asymettric designs for maximum control.